Carlson has dealt with elbow issues since the Mariners drafted him in the second round of the 2017 draft. Sam Carlson’s 2018 season is done without ever really getting started. The young right-handed pitcher, who was rated as the organization’s top pitching prospect by nearly every media and baseball outlet coming into the season, underwent surgery to repair a torn ulnar collateral ligament on Monday in Arlington, Texas. Baseball sources confirmed the report from MLB.com on Monday. Carlson also sent out updates via social media. Dr. Keith Meister, the team orthopedist for the Texas Rangers and Dallas Stars, performed the procedure. Typical recovery time for a UCL replacement is 12-15 months. Carlson posted a picture of himself post-op on instgram (below) with the comment. 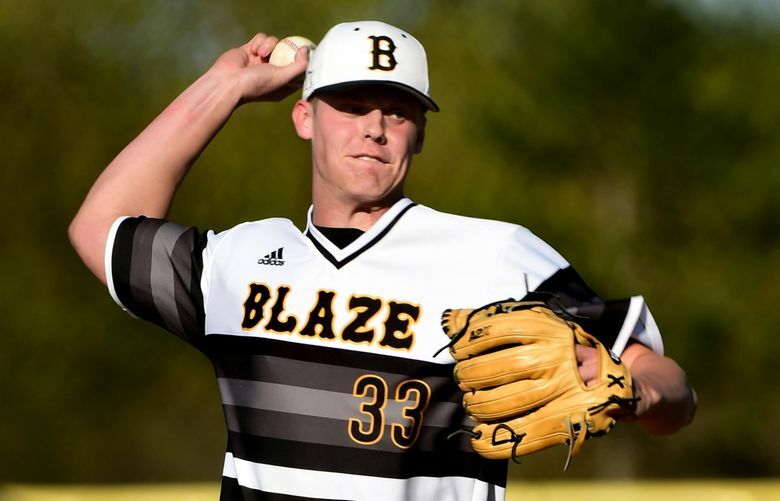 Carlson, 20, has dealt with arm issues since the Mariners selected him in the second round (55th overall) of the 2017 draft out of Burnsville High School in Minnesota. He pitched in two Arizona Rookie League games in 2017, throwing three innings. But he developed minor elbow discomfort and was shut down for the rest of the season as a precaution. The Mariners hoped that an offseason of rest and strengthening would allow Carlson to come back healthy for this season. But the elbow and forearm discomfort returned during the Mariners’ mini-camp in February. He was shut down again and given a Platelet Rich Plasma (PRP) injection. After rehabbing and strengthening the arm again, he’d recently resumed throwing off the mound as part of his throwing program. But a setback forced him to have the surgery. Dipoto said Carlson was frustrated by not being able to get back to normal.